"This dish is so easy to make, but tastes like you slaved away in the kitchen. When purchasing the scallops, be sure to look for a subtle pink or creme color. Stark white scallops have been soaked in water to add extra weight. Other pastas such as rotini, shells, or penne can be substituted for the farfalle. Makes an excellent main course, or add spinach or asparagus to turn it into a meal in itself. My pookie likes to have this dish served with antipasto of buffalo mozzarella, artichoke hearts, and fire roasted tomatoes." Bring a large pot of water to a boil. Cook pasta in boiling water for 8 to 10 minutes, or until al dente. Drain, rinse, and transfer to a large serving bowl. Meanwhile, place scallops in a large bowl. In a small bowl, mix together 1/4 cup olive oil, lemon juice, 1 teaspoon garlic, 1/2 teaspoon salt, and the black pepper. Pour mixture over scallops. Arrange scallops in a single layer in a large baking dish or plate. Sprinkle 1 tablespoon dried basil over scallops so that only one side is sparsely coated with basil. Heat a large skillet over medium-high, and melt one tablespoon of butter in the pan. Place 12 scallops basil-side down, and cook for about 3 to 4 minutes until dark golden brown. Turn scallops, and cook the other side. Cook the remaining 12 scallops the same way. In a small saucepan, melt remaining butter with 1/2 cup olive oil, 1 tablespoon basil, 1/2 teaspoon garlic, and 1/2 teaspoon salt. Toss pasta with butter and olive oil mixture. 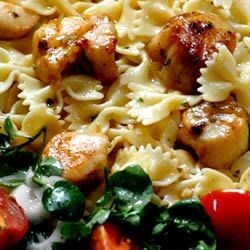 Divide pasta onto plates, and top with scallops. This was good. The butter, garlic and lemon combination is very tasty. I used fresh basil instead of dried, but otherwise followed the recipe as written.